This weekend we donated 2 bikes – an outgrown bike belonging to our youngest son and my bike which I never ride. It was great to let go of 2 large items that were taking up a lot of space in our very tiny garden shed. What was even more wonderful was finding a really good home for them. We found a bike recycling charity where pre-owned bikes are refurbished and then sold at affordable prices thus encouraging people who might not otherwise be able to afford a bike to adopt a healthy lifestyle. The scheme also helps unemployed people learn valuable skills and removes waste scrap metal from the waste stream. Getting rid of these bikes has been on our to-list for a long time so why the procrastination? The Post-it note above was written in November so it's taken us 4 months to finally get round to deciding what to do with these bikes. I've been thinking about why I procrastinated over letting go of the bikes for so long. Here are some possible reasons. Making a decision. Deciding whether to sell or donate. I don't know why I deliberated – these days I usually donate. Lack of energy. It's cold outside so who wants to venture out to the garden shed or load bikes into the car? Boring task. I'd rather sort through old books or clothes than deal with outdoor stuff, especially in winter. Sentimentality or letting go of a fantasy. Hubs was a lot more keen to get rid of the bikes than me. I think I was holding onto part of my son's childhood and a fantasy that one day I would cycle everywhere. Dealing with failure. I should never have bought the bike as I only used it several times. Ignoring that we needed to get rid of the bikes was my way of ignoring my mistake. Here are my notes-to-self to help spur me on with further decluttering. 1. Put decluttering on your to-do lists. Set tasks for today, tomorrow, later in the week, the month. 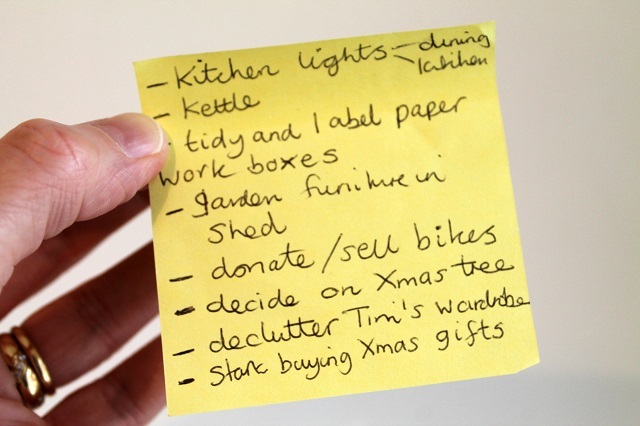 You will eventually get fed up of seeing the same decluttering action remaining on your lists. 2. Imagine empty spaces (or at least emptier). Our aim was to have more room in the shed for our newly acquired garden furniture. 3. Don't procrastinate just start. Easier said than done, I know, but think of the cumulative effect of getting rid of 1 or 2 things a week or spending a little time decluttering every few days. 4. Reward yourself – after donating our bikes we stopped off at a nearby canalside cafe. My treat was a pot of Earl Grey, tiffin cake and the colourful sight of barges passing by. 5. Work through the boredom – it can be tedious making decisions about what to do with unwanted items and spending time organising their removal but think of the benefits you and others will gain. As for the other items on the list they are all started or completed. New kitchen lights – pendant lights bought and installed over dining table. We still need to choose a new spotlight for the kitchen area. Kettle – new red kettle bought to replace our old leaky one. Tidy and label paperwork boxes - some clearing out has been achieved and the boxes have been labelled with contents. Garden furniture in shed – we now have space to store our folding table and chairs. Decide on Xmas tree – yes for 2014. Declutter Tim's wardrobe – one session done but more work needed. Start buying Xmas gifts – yes but I will start earlier this year. Hurrah for the Post-it note I say. Invented accidentally by scientist Spencer Silver in 1968 when he was trying to produce a tough new glue but instead came up with an adhesive that could be repositioned. Several years later his colleague Art Fry realised a need for Silver's invention when he needed a bookmark for his hymn book that would neither fall out or damage the pages. And so the Post-it note was born. I love this story. Have a great week and thanks for reading, following and commenting here. I fall in to the trap of putting too much stuff on my to-do lists. II'm getting better at thinking about what I can realistically achieve and not beating myself up when it doesn't get done. Well done on the bikes. That sounds like a win:win situation for you and the recipients. It's nice to get rid of something large as you really notice the difference. I am really struggling with de-cluttering, in fact I always have done. I put a sentimental value on everything. I really need to sort out my mentality regarding this. We have a double garage stuffed to the rafters with clutter - not a chance of parking a car in there!! There are toys from my children's earlier years (they are now 27, 25 and 22) and I just can't bear to get rid, i.e the red bubble car from ELC, 3-tot rocker, monkey bike, 2- seater go-cart, etc. - the list goes on. I really need to get a grip on this. I am envious of people who can de-clutter with seemingly no effort! Ha! In this house we have The 14 Month List - reflecting how long it tends to take before we actually get on and DO stuff. But you're right, by-passing the procrastination phase would be so good, worth trying to do it. One thing that has helped is I now keep an old cardboard box by the front door. Into it goes any small items we want to get rid of. When it's full, I take it all down to one of the local charity shops. Job done! I am a master procrastinator. I think there is definitely some sentimental value to children's bikes. We still have a few that I can't talk myself into donating. Well done for donating yours, an excellen use for no longer needed bikes. We don't have lists of things to do because we don't like to be reminded how inefficient we are.... I am feeling quite guilty just typing this. Hurrah for post-it notes! I have set aside some time next month to tackle the very long over due de-cluttering of the loft. It is a disgrace, and yet I am full of nostalgia for it is full of the boys childhood. We also have bikes that need to find a good home. I shall be looking to see whether there is anywhere similar to donate them. You seem to have worked out why you were procrastinating Claire and that really helps in dealing with it. I'm similar to Everyday Life on a Shoestring in that I used to have too many things on my to-do list but I also like to have a few "future" projects.